NFC Bluetooth Receiver - iHarbort Bluetooth Audio Adapter (NFC Enabled) for Stereo Sound System with Long Range and High acoustic fidelity, Connect with your Smart Phone, iPad, Tablet and etc (Black) by iHarbort at movies-out.com. MPN: NFCBR. Hurry! Limited time offer. Offer valid only while supplies last. iHarbort Bluetooth Receiver makes your traditional speakers turn into a wireless sound system by plugging this adapter into your speakers. 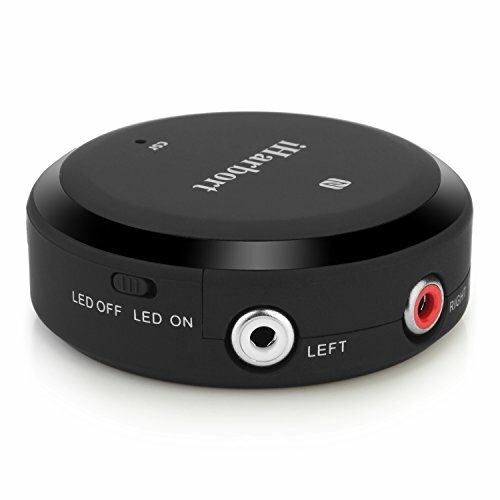 Easy to operate: Connect this bluetooth receiver to your speaker through 3.5mm or /and 2RCA audio cable,and then pair your bluetooth enabled devices to enjoy music. Wide Compatibility: bluetooth 4.1 receiver connects your bluetooth-enabled phone, tablet or laptop to any A/V receivers and any powered speakers (without bluetooth function) using standard 3.5mm jacks or 2RCA left and right sound, ideal for home theaters, stereo systems, and car stereos; compatible with Smart Phones, iPod Touch, iPhone, iPad, and Android devices. Package contains: NFC desktop bluetooth audio receiver*1; Audio cable *1; USB charging cable *1 User manual *1. One year guarantee. And it needs power supply all the time when working.